CRAG were one of the stories from the 1991 Local Elections as they swept the boards in Cavan with all of their four candidates elected. 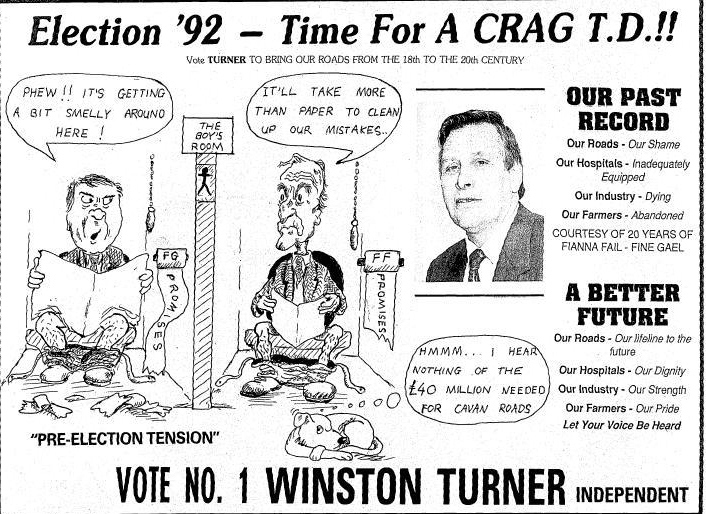 Following that Winston Turner stood For CRAG (Cavan Road Action Group) in the 1992 General Election where he polled 1,825 votes and missed out on a seat. 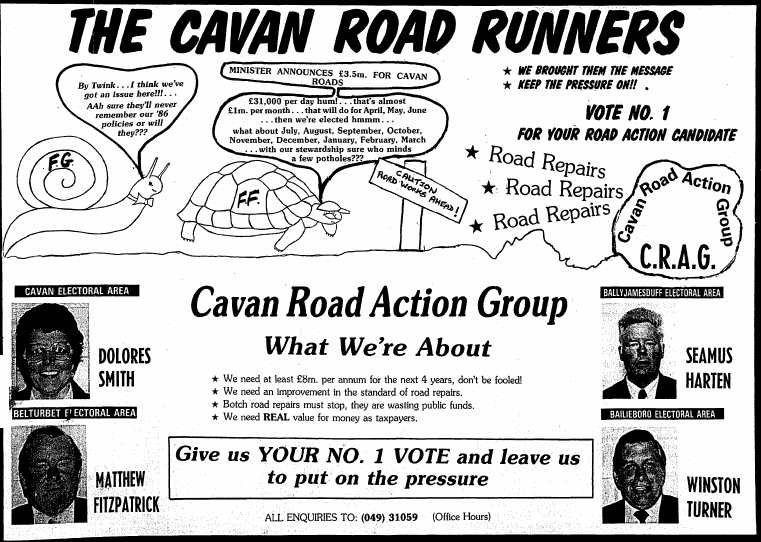 From the 1991 Local Elections an Ad for The Cavan Road Action Group (CRAG) who ran four candidates. All four were elected. It was one of the main talking points after the election. Matthew Fitzpatrick topped the poll in Belterbet polling 1,071 votes and was elected on the first count. Dolores Smith topped the poll in Cavan polling 1,001 votes and was also elected on the first count. Winston Turner topped the poll in Bailieborough polling 958 votes and was also elected on the first count. Seamus Harten polled 664 votes and took the forth seat in Ballyjamesduff. In 1999 Winston Turner held on to his seat, with Dolores Smith and Matthew Fitzpatrick both losing their seats. Seamus Harten didn’t contest the 1999 election.